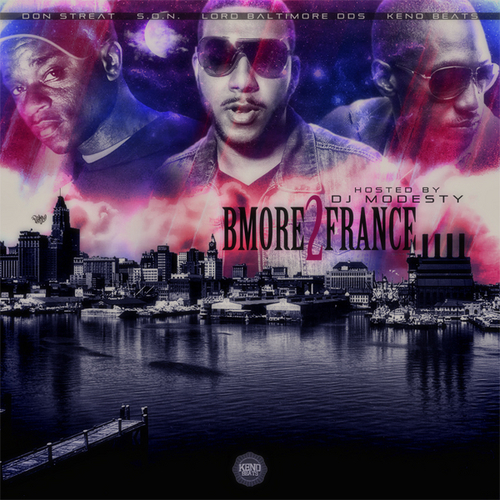 Bmore 2 France is a 17 track journey that take listeners to the boom-bap days of hip-hop showing a true love of the art through having fun while at the same time touching on topics and dropping some seeds of knowledge that anybody could relate to. Since all the artist are from Baltimore they wanted to break up the monotony of the stereo-typical audio back drop from the wire and just concentrate on being MCs without any pressure of having anything to live up to. The album is truly an international delight as it features artist from France, Sweden, The UK and of course the US. The whole mixtape is produced by Keno Beats from France except two songs which are produced by OZee. Features include DJ Battle, The Boy Blesst, Only the Kid, Cayoz da beast, and Phileas flow. Cuts are handled by Dj Modesty, DJ Qvali, DJ Myzter Hurd, and Jabbathakut.